Wassailing in the UK is the activity of singing to orchard trees to wake them from their dormancy at the end of deepest winter. It is mainly practiced in the cider-producing West of England, primarily the counties of Devon, Somerset, Dorset, Gloucestershire and Herefordshire. Wassailing refers to drinking and singing the health of trees, in the hopes that they might better thrive. The word wassail comes from “vas heil” believed to originate from the Norse language. It means ‘good health’ and relates to the English phrase ‘hale and hearty’ meaning well. The purpose of Wassailing is to awake the cider apple trees in cider apple orchards, to scare away evil spirits to ensure a good harvest of fruit, in the Autumn. The ceremonies of each wassail vary from village to village but they generally all have the same core elements. A Wassail King and Queen lead the song and/or a processional tune to be played/sung from one orchard to the next. The Wassail Queen will then be lifted up into the boughs of the tree where she will place toast soaked in Wassail from the Clayen Cup as a gift to the tree spirits. Then the assembled crowd will sing and shout and bang drums and pots and pans and generally make a terrible racket until the guns men give a great final volley through the branches to make sure the work is done and then off to the next orchard. There can be Morris dancers, folk singers and performers, including Mummers (masked mime actors), Green Man (wild man of the woods/seasonal fertility), Minstrels. Some of the most important wassails are held annually in Carhampton and Dunster, in Somerset and Whimple and Sandford in Devon. These are usually held on the 17th January, which is the old Twelfth Night. My wife and I visited a brilliant Wassail event at the 15th Century, Fleece Inn near Evesham, a couple of years ago. A fabulous traditional and atmospheric event, from a bygone age…don’t miss it. The inn is now owned by the National Trust. Saturday, 14th January 2017, sees the return of the Fleece Inn annual Wassail. From dusk the apple orchard becomes alive with cider, singing and Morris men. Celebrate this pagan tradition of waking the trees to encourage a good harvest in preparation for next year’s cider, fun for all the family and a brilliant way to dispel those winter blues! The approximate timings are Morris Dancing from 6.15pm, Procession to orchard 7.15pm, Toasting of the trees 7.20pm. The Wassail is followed by a folk music session in the barn. Wassailling is all about resurrection, the re-birth and fertility of trees. However, there is an inherent artistic quality, a statuesque beauty of a tree in all its winter glory. Winter trees lying, dormant, frozen in time, waiting for the caress of warm spring sunlight that will offer resurrection. It’s the cyclic nature of the natural world. The beauty of trees in simple silhouette, is captured by the ‘Trees and Woodland’ Metal Wall Art at Brilliant Wall Art. There are also winter tree scenes which capture the essence of stasis. 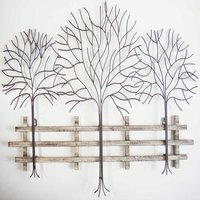 My favourite is the Large Windy Oak Tree Metal Wall Art decorative piece, which can be used as a photo or card holder if you bend the branches of the tree. It is easy to hang and measures approximately 75cm (29.5") high by 60cm (23.5") wide. At Brilliant Wall Art we specialise in the wall art we sell, and we are continually striving to offer the very best in products and customer service. Check back on a regular basis as we are always searching for new products to offer our customers at the lowest possible prices. No other store is as committed as we are to the satisfaction of our customers, and therefore we will continue to offer the very best products at affordable prices. Brilliant Wall Art promise to be the most competitive online service and therefore the cheapest. BWA Price Promise - If you see the same product advertised at a lower price including delivery and in stock we will endeavour to match the price and where possible beat it. Simply contact our team with details of the store or web-site that you have seen the product(s) at a cheaper price and let us do the rest.